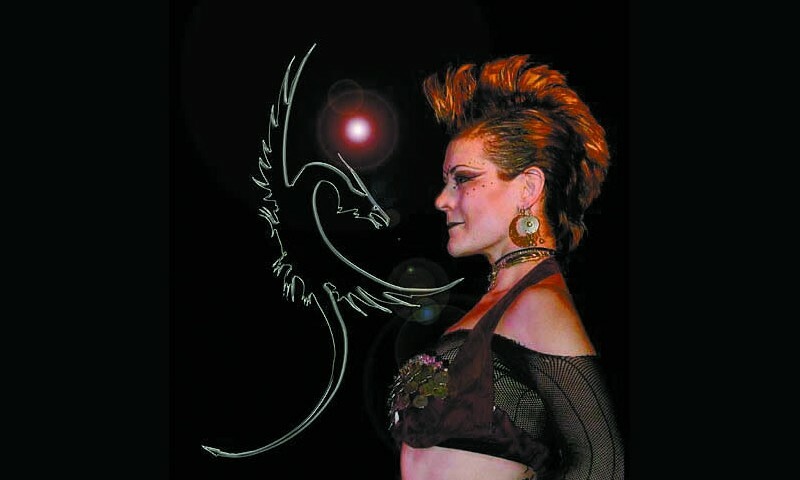 Dragomi, an urban tribal fusion dance troupe, expresses the energy of the dragon in their choreography and explores dancing to alternative music like “X-Amount of Words” by Blue October, “Dead Girl” by Rob Zombie, and music by German artists such as Rammstein and Eisbrecher. Jaci, a member of Dragomi, articulates such power and control while performing, that it is easy to believe she is the essence of the dragon. Enhanced by her costuming, make-up, and an impressive mohawk, she invokes an ancient primal spirit and coaxes it into movement. The depth, to which she is willing to descend within herself, creates magic on stage. She evokes a memory of female strength and authority, while maintaining the beauty and sensuality of the dance. It is mythical, mesmerizing, and eternal. Her solo performances are raw and contemporary—urban and dark—timeless and feminine. Jaci has been dancing for 22 years, and in Salt Lake City for the past two years. Her background in dance includes tap, ballroom, ballet, jazz, swing, country line dancing, and classic belly dancing. She has been a stage actor, a stand up comedienne, and fulfilled a four-year tour of duty in Germany with the U. S. Air Force. She discovered urban tribal fusion when a friend showed her a video of Rachel Brice. Formerly from Idaho, her husband’s tales of Salt Lake’s belly dancing community lured Jaci to Salt Lake City. Synchronicity placed her in a work setting with Fvorboda, director of Dragomi, and the rest, as they say, is history. Today, Jaci dances with Dragomi, performs solo, and is teaching tribal fusion dance. “Over the last decade, a change has occurred throughout pop culture regarding female attractiveness,” said Jaci. “The female of this era has become more dark—more powerful. This type of darkness is not evil or negative. It is strength and physical power. Women in the movies used to be the damsel in distress. Today, the women in the movies are saving the world!” Jaci and Dragomi will be performing at the Boise Fusion Festival, June 2; The Dark Arts Festival, Salt Lake City, June 9; and the Utah Belly Dance Festival, Salt Lake City, August 17-18.